Each year The Center for Cooperative Education and Career Development survey’s the graduating class to analyze and report on employment and graduate school status of students’ post-graduation. Responses are collected at the December, April, and August commencements, and again six months later from all graduates who reported they were still seeking employment at graduation. These efforts resulted in a 70% knowledge rate of day student career outcomes. Wentworth graduates obtain well-paying jobs in a wide range of fields and we are seeing a continuation of this trend from the class of 2017. Of those that we do have data, 98% are in graduate school or are employed and their median salary is $60,000, slightly higher than the NACE reported national median and higher than the last few years of Wentworth’s graduates. More than half (56%) received offers of employment from one of their co-op employers and 36% accepted. We have a knowledge rate of 24% of CPCE graduates, down significantly from prior years. Of those that reported, 100% are employed or in school. The median salary of a CPCE graduate is $71,500. Of those that are employed, 96% of students report that their work is related to their academic major, up from last year’s 92%. This year, seven employers hired at least four members of the class of 2017. Most our graduates continue to live in the Northeast with Massachusetts overwhelmingly having the most, followed by New Hampshire, Connecticut and Rhode Island. Outside of New England, many of our students are working in New York, California and Pennsylvania. Of those that we have data, 14% of our students are going on to graduate school. The majors that are sending the most to graduate school are: Architecture, Biomedical Engineering, and Civil Engineering. Most students are continuing their education at Wentworth. More than one is heading to Northeastern and Tufts University. Some of the unique schools to which an alumnus is attending are: Georgetown University, Johns Hopkins University, the Institute of Technology Eindhoven, and University of Southern California. Most our students are seeking an M. Arch followed by an M.S. Three are seeking an MBA, two are seeking a PhD, and one is seeking an MPS. For the third year, the survey asked graduates from the College of Professional and Continuing Education about the impact their Wentworth education has had on their professional life. Of those that reported, 50% reported receiving a promotion and 43% reported receiving a salary increase. Seventy-seven percent reported that job opportunities are available to them now that were not prior to their degree, 72% reported that their job performance has improved, 77% reported that their technical knowledge and skills have improved and 73% report feeling more confident in the workplace. 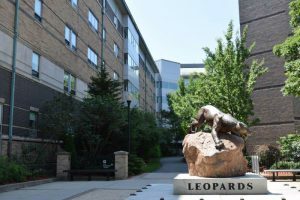 Using the learning outcomes of each of the day program’s majors, the survey asked questions to measure the effectiveness of the education at Wentworth. This data is reported on for each major and may be used for accreditation purposes. The comprehensive report, including salary and employment data broken down by major can be found on our website.